Each Quick Mount flashing includes all stainless steel hardware preventing rust and corrosion, ensuring that your array will stay put for a long time to come. Quick Mount also includes the patented QBlock elevated water seal to keep water out of the roof penetrations, ensuring that the integrity of the roof isn't compromised. The QSMC flashing from Quick Mount provides you with an easy method for attaching most rail systems to your roof. The Quick Mount flashing works with composite, asphalt and wood shingles with a course length of 5 to 5.625" and an exposed course of 5.75" or less. 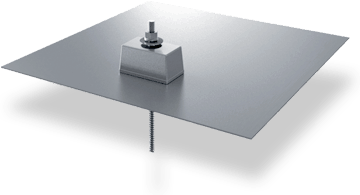 To install, simply slide the flashing underneath the shingle, drill a single hole into the roof rafter, insert the QBlock and fasten down with stainless steel mounting hardware. It is backed by solid engineering and certified for strength and waterproofing by the ICC-ES (ICC-ESR-2835). The Classic Composition Mount is the most universally code-compliant mount available for composition/asphalt shingle roofs.